If you’re in our neck of the woods right about now, you’re probably seeing red. Strawberry red that is. Local markets and grocery stores are being flooded with them. And this year should be a particularly good haul when you take in the April showers leading to May flowers and all. And while the prices right now, and the produce, are fantastic there’s nothing quite as good as the strawberry you pick off of the vine yourself. If you haven’t already, my advice would be to find a local patch in your neck of the woods, and get in on some of the pick your own berry goodness. It’s a fun afternoon for the whole family, and we always leave with gorgeous pictures of the kids with their strawberry stained lips and fingers. It’s the perfect natural back drop. I’ve got to confess though, that I can’t wait another week until our patch opens for picking. So, I bought a few tubs from the store. I’ll just call it ‘anticipation building’ for the main event. 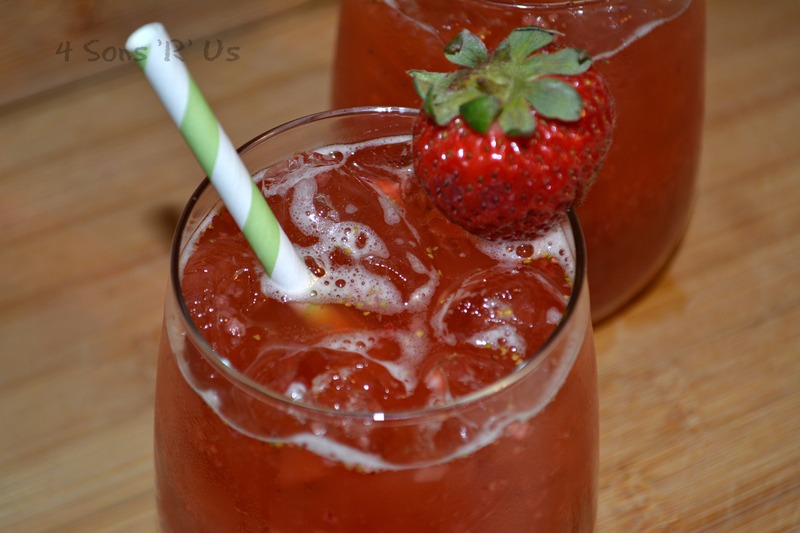 And one of my favorite things to make with them, and the first batch this year, is this sweet southern tea infused with all the fresh strawberry flavor. Now, doesn’t that just look like a glass full of yum. A cold glass of this is the perfect thing to enjoy on a warm Spring day. And while it tastes all kinds of complex and you’d assume it’s complicated to make, it’s not. It’s so simple. The whole world should know. So, whether you choose to purcahse or pick em, embrace that Southern drawl, get your pitcher of tea ready, and find a front porch with a rocking chair, or even a swing, and get to sippin ya’ll! 5 tea bags of your favorite tea. 1. Start by making the tea. Bring four cups of water to a boil and then let the tea steep , for about 5 minutes, while you prepare the other ingredients. In a food processor, or in a blender, frappe’ the strawberries. 2. You will need about 2 lemons to get 1/3 cup of lemon juice, or the stuff from the bottle works just fine. 3. After the tea has steeped for 5 minutes remove the tea bags. 4. Add the sugar to the hot tea and stir until it’s completely dissolved. 5. Fill a pitcher or carafe up 1/2 to 3/4 of the way with ice cubes. 6. Pour the strawberry frapp into a mesh strainer placed over a bowl. Using a wooden spoon rub the strawberry juice through, while leaving behind as many of the seeds as possible. Pour the strained strawberry juice and the lemon juice into the pitcher. 7. Pour the tea in the pitcher and stir to combine everything. 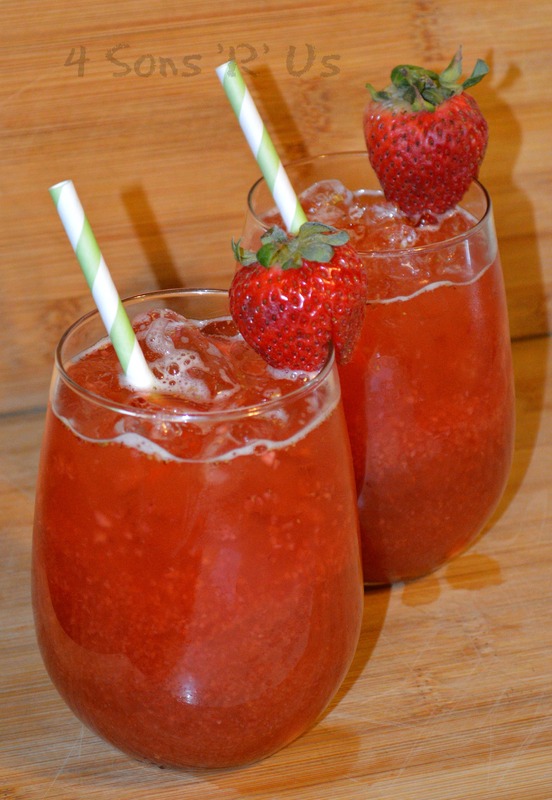 So many strawberry recipes this week, and I love it! This dish looks so simple and sweet. Happy FF, and have a fabulous weekend! It’s both of those! And a perfect springtime cocktail to enjoy. Strawberries are one of the best things about this time of year, although it’s still a little longer until we can get local ones up here. Nice idea to have them in tea. Thanks for sharing with FF! Years a go there was a tea that tasted like bubble gum. I don’t remember which tea it was I was wondering if any one knows which one it is? Thanks for the help if any one knows which one it is. Dianna, it’s an Asian tea. Check out any local Asian markets and they should be able to help you find what you’re looking for!